Today, I bring you a Superbowl-friendly brunch recipe – it’ll keep you satiated until the big Superbowl festivities later tonight. Seriously, when I first had this for breakfast around 11pm, I wasn’t hungry until about 4pm. Plus, it’ll keep you fueled while you’re running around, picking up last-minute ingredients for those football shaped cookies! Okay, so this one’s a biiit of a stretch – it’s not exactly “migas,” because I’m not replacing the tortilla strips with anything. This Tex-Mex version consisted of scrambled eggs, peppers, onions, chorzio and tortilla strips. I remember ordering extra salsa and pretty much didn’t take a moment to breath while I inhaled that breakfast. 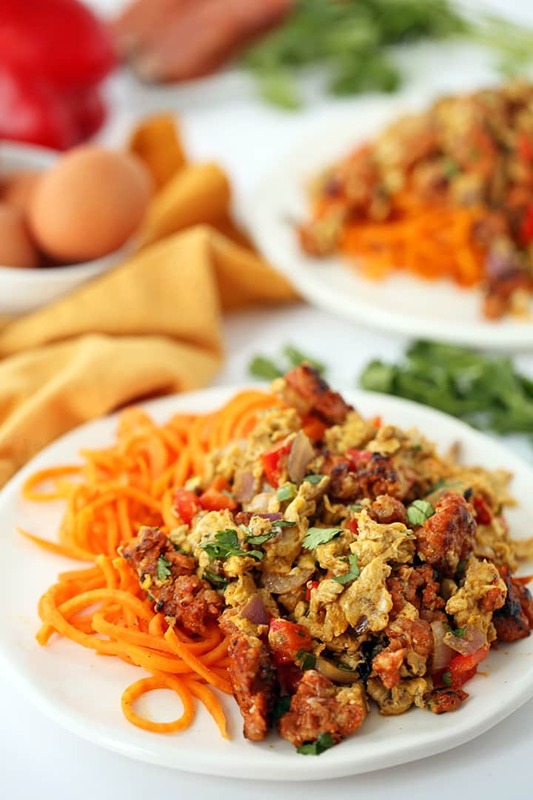 To Inspiralize this dish, I simply took out the tortillas and instead, I’ve put this scramble over sweet potato noodles. The sweetness in the sweet potatoes works wonders with the spiciness of the chorizo for an epic breakfast meal. If you really wanted to make this more like the original, you could add the sweet potato into the skillet while you scramble the eggs, so everything combines together. Drizzle a little pico de gallo on top, add some sliced avocado and you’re on your way to pure breakfast joy! I contemplated adding cheese to this dish (like a habanero pepper jack), but once I tasted how outstanding it was without, I decided to omit. However, if you’re a cheese-lover and you’re not trying to manage that waistline, add it in! Plus, I’m a big proponent on the weekends of the “eat like a king for breakfast, a prince for lunch and a pauper for dinner” mantra. Also, most chorizo is naturally spicy, so if you aren’t a fan of spicy, omit the jalapeno in this recipe! I love spicy, so I’m biased when I write these recipes. Hey, at least I warned ya! 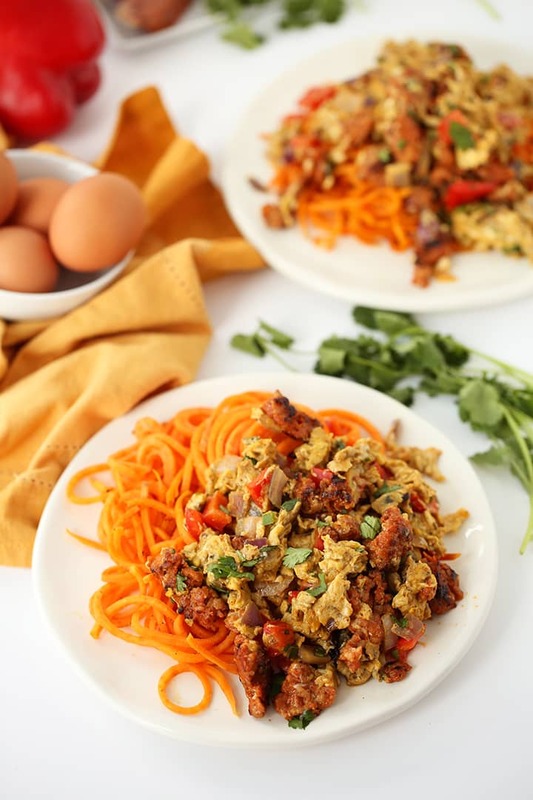 Cheers to more spiralized breakfasts, right?! 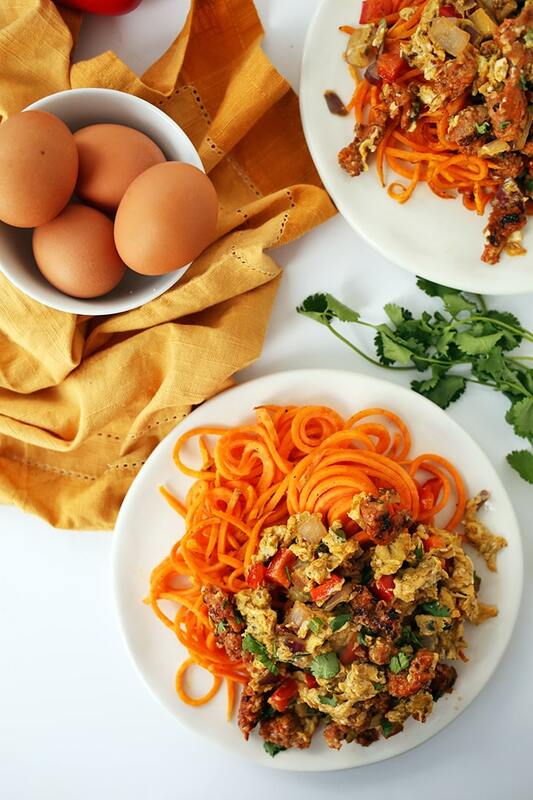 Do you like to spiralize for breakfast? Place a large skillet over medium heat and add in the olive oil. Once oil heats, add in the sweet potato noodles and season with garlic powder, salt and pepper. Cover and cook, uncovering occasionally to toss, for 5-7 minutes or until potato noodles are cooked to al dente. Set the noodles aside in three plates and cover (with tinfoil or a plate) and then add the chorizo to the skillet, crumbling with a wooden spoon. Cook the chorizo until browned, about 7 minutes. Set aside, using a slotted spoon. Immediately add in the onions, bell pepper and jalapeno. Season with paprika, oregano and salt and pepper and cook for about 3 minutes or until vegetables soften. Then, add in the cooked chorizo and the eggs. Cook until the eggs are scrambled. 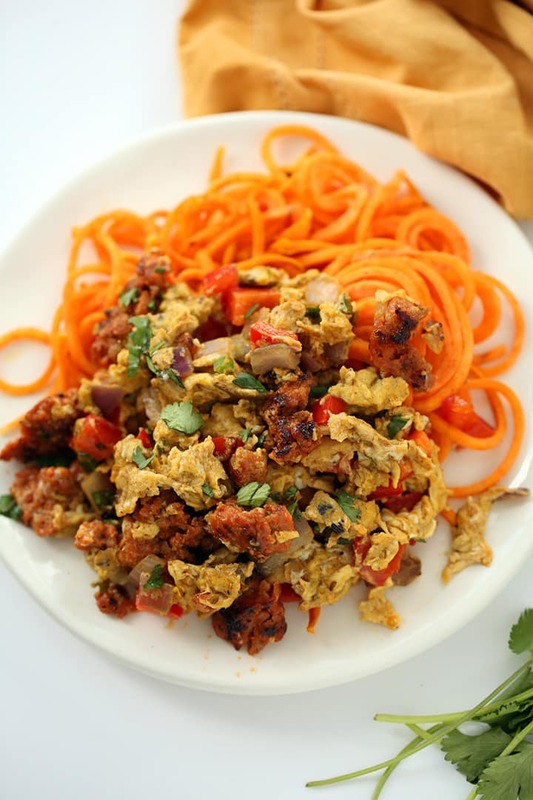 Divide the chorizo-egg mixture on top of the sweet potato noodles. Garnish with cilantro and serve immediately. I must tell you... you have "inspiralized" me! I have always loved cooking (and eating) and have a love of doing food photography. When I stumbled on your blog, you inspired me to get a spiralizer as it all made sense to my "twisted" mind! Yesterday I made a salad with spiralized zucchini that I topped with stir fried veggies and tossed with some coarsely shredded lettuce and peanut sauce. I pulled up one of the pasta-like strands of zucchini to show friends and it was taller than I was and I think they too are now inspiralized after seeing that. This recipe with the sweet potato looks so delicious and I will definitely try it using the soyrizo as I have become a vegetarian after a lifetime of eating meat. Thank you so much for this new twist on eating! BTW... your photograph of this meal is spot on! Love it! Thank You for the breakfast recipe, making my shopping list to sprilize this week. I appreciate all of your hard work Ali! Have a great week! This recipe sounds wonderful, although I would probably make it for lunch or dinner. The issue I have with spiralizing for breakfast is the amount of time it takes to prepare a dish. I have plenty of energy for cooking later in the day but not at the start. If you make it back to San Antonio and want good Mexican food, Ruthie's (on West Ave.) is THE place for a good breakfast. Can't visit San Antonio and not have breakfast at Ruthie's at least once. And the Palenque Grill (on loop 1604) has some of the best, authentic Mexican food we've ever eaten. We have strong opinions about that, living right on the border with Mexico. Finding such fabulous Mexican food in San Antonio was a real surprise (We visit there frequently because my husbands children and grandchildren live there). Sounds perfect to me! I make a stew with chorizo and sweet potato, lots of paprika and lemon juice. I'll make this, I eat a hearty breakfast. Amazing and flavorful! I made a vegetarian version and my whole family is still raving. Thank you! I NEVER write reviews for recipes but had to because this is so good. Reminds me of the migos I had when working in San Antonio- I didn't even miss the tortillas! 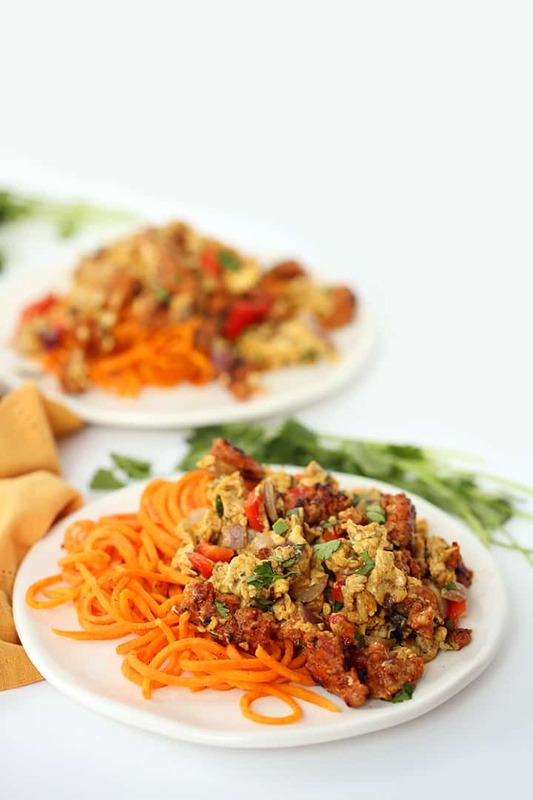 The sweet potato noodles complement the heat of the dish perfectly- I love spicy foods and this is hot, but not too hot! I also subbed half the eggs for just the whites to lighten it up a bit. THANK YOU for a new staple in mi casa!